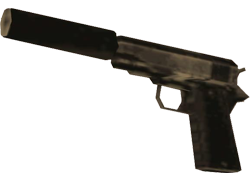 The Silenced 9mm is a Colt M1911 with a sound suppressor, only available in Grand Theft Auto: San Andreas. There were plans for it to feature in Grand Theft Auto IV, but it was cut from the final build. It holds 17 rounds per magazine. Using the Silenced 9mm in public won't cause people to run away like usual, ideal for stealth kills from a distance. However, pointing the gun at innocent pedestrians will cause them to raise their arms in surrender, as normal, and then to run away. Discharging the weapon near an officer will still gain their attention, and attract a Wanted star level, putting an end to stealth. This weapon does not use the same ammo as the standard 9mm. This is presumably because, in addition to the silencer it may be equipped with low-velocity ammo, which makes less noise and would be ideal. Initially, the player cannot aim while moving, and lock-on range, accuracy, rate of fire and strafe are all poor. At "Gangster" level, the player can move while in the aiming stance, with lock-on range, accuracy, rate of fire and strafe speed all increased. At "Hitman" level, the player can fire while moving, and lock-on range, accuracy, rate of fire and strafe speed are all maxed out. Can be obtained from the bodyguards at Madd Dogg's Crib in the mission Madd Dogg's Rhymes, but only if the player chooses to kill them. Despite being modeled after the Colt M1911, the M1911 only has .45 caliber cartridges. This page was last modified on 11 August 2012, at 22:43.